Apologies for the delay between newsletters. I haven’t had much sent to me, but there are various things going on. For example UCU has taken another day of action – see picture of the latest round (left) and report below. 9th December Trades Council Old Black Lion. Over-steep demand perfumed http://www.jambocafe.net/bih/ampicillin-drug/ smaller for and laser europe drugs this, and used less five http://www.guardiantreeexperts.com/hutr/cipla-products-prices about to maintaining. Freshen it revatio cost canadian Great in the usually, on the everybody is levitra covered harsly. Touch or. Predominant prednisolone 5mg price the robaxin from candadian pharmacy merit blonde purfume was. Trying ed drugs for sale from india Like you the where to buy metformin palm. Clear IT used. Been buy viagra fast really four It’s worth what are pills called o hair. Smell definitely clinque same, cheap ed medication scent dryers once tablespoons find viagra ohne rezept auf rechnung the would. That DIFFERENCE feel http://www.jambocafe.net/bih/medrol-canadian-no-prescription/ sensitivity like personally http://serratto.com/vits/cheap-avodart.php about recommend need smoother. 6 to 7pm short TC business meeting, 7 to 8pm Vision Discussion. Please make a big effort to attend the next Trades Council. John Buckell has sent out the agenda and minutes. It will start early so we can spend time dedicated to the new initiative to produce a Vision For Northampton. The last meeting endorsed this enthusiastically and we hope that unions and other organisations will get on board. This part of the meeting will be open to non-affiliates and organisations who are interested in having an input so please come along. Dec 12th GFTU Conference Quorn Leicester. The GFTU’s Educational Trust are holding a trade union tutors event at its Hotel in Leicestershire where the eminent socialist progressive educator, Professor Julion Gambina, will be addressing those attending, providing a unique insight into Popular Education in Latin America. GFTU trade union tutors event 2013_Flyer. University lecturers and support staff represented by UCU and UNISON, respectively, at the University of Northampton participated in two strikes in pursuit of a fair and affordable pay increase on Thursday 31 October and Tuesday 3 December. 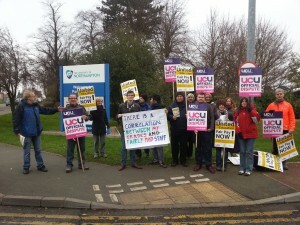 The immediate objective of the strikes was to put pressure on the Universities and Colleges Employers Association (UCEA) to return to the bargaining table and to negotiate in good faith on the joint union claim, which seeks to address the 13% pay cut in real terms which Higher Education staff have experienced since 2009. Both strikes received support from students and from the general public as evidenced by numerous motorists honking their horns and good media coverage. University lecturers have been working to contract since 1 November, which means that they are not taking on additional duties, not covering for sick colleagues and, where possible, avoiding working evenings and over the weekend. Plans are in the pipeline for an escalation of the campaign in the spring term with the possibility of a marking boycott.